I've been clinging to the same beat up Dirt Devil Vibe Upright (with Power Brush attachment!) since I bought it on clearance ten years ago. The suction is terrible, it's as loud as a cement mixer, and it weighs about as much as that cement mixer. Needless to say, I have been in need of a new vacuum for quite some time, but never did I think that vacuum would be a Roomba. Truth be told: I always thought robot vacuums/sweepers were a bit of a gimmick, something for tech-junkies or, well, the lazy. 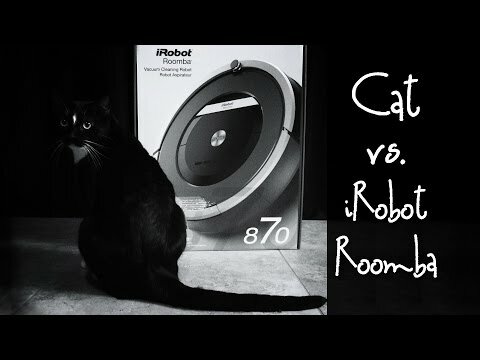 So when it arrived in the mail, I opened it with both skepticism and cynicism, thinking, if nothing else, the Roomba would serve as a fun new torture device for our cat, Sherlock. As much as it pains me to admit, I am now eating crow. The Roomba 870, despite a few limitations, is an incredible appliance and I will (probably) not speak ill-ly of them again. * Transitions pretty smoothly from the tile to carpet. It only got hung up once, but only because it hit a warped part of the rubber carpet stripping. * Warranty. Comes with one-year limited standard, but with an appliance with this much technology, and at this price point, I would expect at least 5, if not 10, years of coverage. If you're on the fence about buying a Roomba, take it from me that it's worth the plunge. I'm now thinking of getting one for my mom and step-dad, who also own a cat, and just don't have much time or energy to vacuum their place. And if you're curious, besides functioning as a high-tech cleaning device, it definitely delivers as an entertaining torture machine for pets.